Buy ScreenDefend Ultra Clear Screen Guard for Acer Notebook with Standard 10.1 inch Screen (H: 12.5 x W: 22.2cm) online - Clublaptop - The largest online store by Manufacturer of Laptop Accessories and Spares. Screendefend high quality laptop screen protector are best screen protectors in India. Screendefend screen guards are ultra-clear and acts as anti glare screen protector, 100% compatible with all the laptops and notebooks. 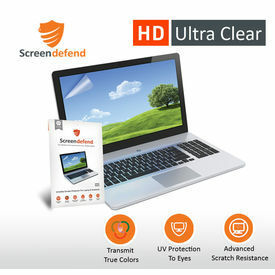 Screendefend screen guard provides best LCD screen protection to your laptop screen. Screendefend screenguards comes in 3 layers and are available in different sizes. Screendefend screen protectors are made from high quality non-sticky material and can be easily removed without leaving any residue behind. We promise original like visual experience with no compromise on quality and clarity of screen. Product Code LSC Screendefend 10.1"